cutting spending on much of anything. Child care scored the worst for some reason, getting more hostility than even perennial bogeymen like foreign aid and welfare. Still, even at that, only 20% of conservatives wanted to cut child care spending, and scores dropped precipitously from there. What to make of this? It’s a pretty good guess that if conservatives don’t want to cut Social Security then they don’t want to cut Medicare either. War on terrorism is probably a pretty good proxy for the defense budget. Low scores for public schools + welfare + aid to the poor suggests they don’t really want to cut social safety net programs. And interest on the national debt is off limits no matter what they think. That accounts for about 90% of the federal budget right there, and spending on highways, the environment, crime, science, and foreign aid probably takes care of another 5%. And that’s pretty much the whole ball of wax. The lesson from this? It turns out that conservative politicians really do represent their base pretty well. They like to yammer endlessly about cutting spending, but when push comes to shove, there’s not much they really think we’re spending too much on. It’s all just venting. UPDATE: It turns out that Sides made some mistakes in his original chart. The corrected version is on the right, and a corrected post is here. The basic point still holds: conservatives aren’t in favor of cutting very much. 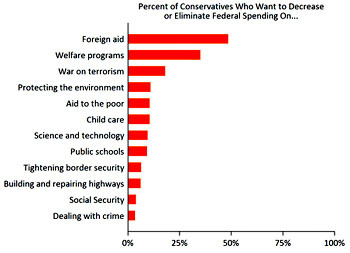 However, foreign aid is still a bogeyman, though it represents only a tiny part of the federal budget, and conservatives are in favor of cutting “welfare” generally, though not so much in favor of cutting specific welfare programs. This makes a little more sense: opposition to “welfare” is a longstanding conservative issue. 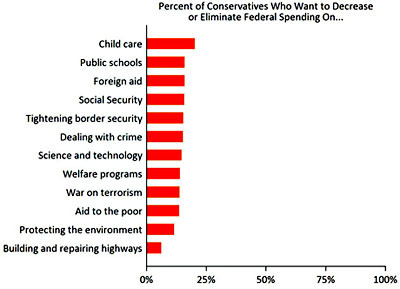 Still, when you get down to specifics, there still aren’t very many programs that more than a small fraction of conservatives actually want to cut.